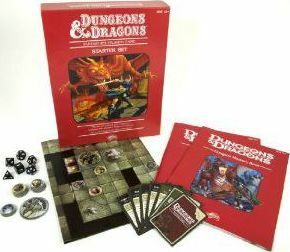 As I have stated I started role playing games with Star Frontiers and moved on quickly with the “Red Box” Dungeons and Dragons edition made especially famous by the Larry Elmore cover. 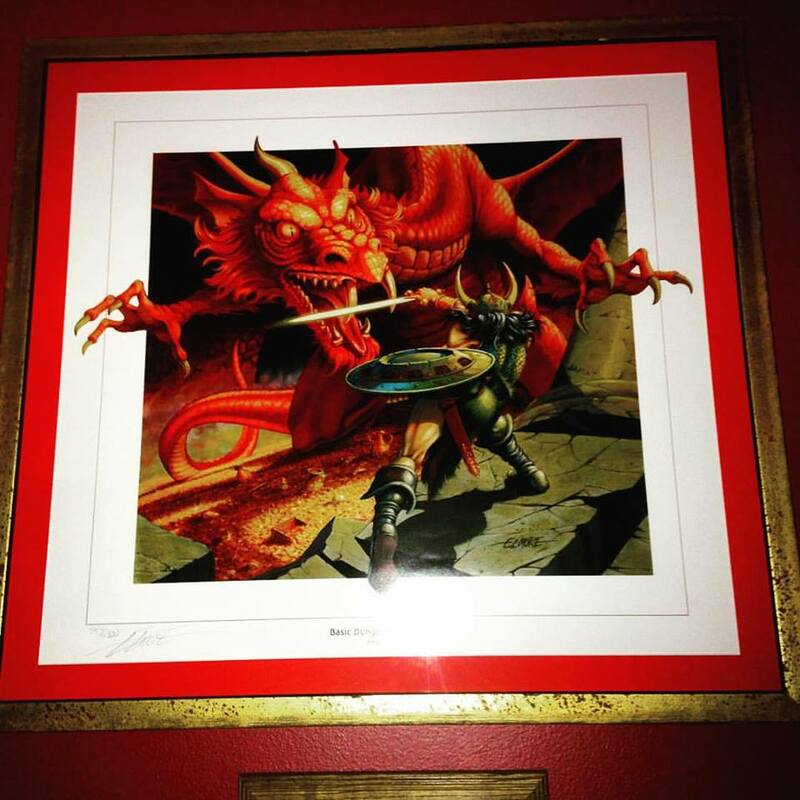 My signed print of “Ancient Red” by Larry Elmore. I discovered “orange spine” Advanced Dungeons and Dragons shortly after and I don’t even remember how, I think it was some older kids at my school. Some of the classic modules that we ran with “Basic” D&D and AD&D rules were: B2 The Keep on the Borderlands (I still run that thing), AC2 The Treasure of the Hideous One, S3 Expedition to the Barrier Peaks (be prepared to break your D&D game forever), D1-2 Descent Into the Depths of the Earth, L1 The Secret of Bone Hill, I6 Ravenloft and my favorite of all time UK1 Beyond the Crystal Cave (another one that could break your game). Orange Spine AD&D would be my Dio cover band. I am from Small Town, Indiana so famous a place that John Cougar Mellencamp wrote a song about it. You may have overheard it. It was so Small Town that when I moved to that town I was “that kid” that introduced Dungeons and Dragons. This was during the High Holy Days of the great 80s Satanic Panic and I listened to heavy metal too. In fact, we used to play D&D at my cousin’s house as he had a huge room that was plastered in Iron Maiden “Eddie” posters. That’s me, infamous for my strong nerd-fu. As I got older I fell out of playing for a while and then fell back in thanks to my friend Louis who was running a West End Games Star Wars at Castle Comics in Lafayette, IN. This was pre-prequels and how we became friends was WEG Star Wars. So I got into Advanced Dungeons Second Edition for a short time and had a lot of fun with that. 2E may be the Gold Standard for AD&D. This was in time for Dungeons and Dragons Third Edition to be released and for several years D&D 3E was D&D to me. Making it backwards compatible with “1E” and “2E” wasn’t terribly difficult, I could convert the stats in my head. 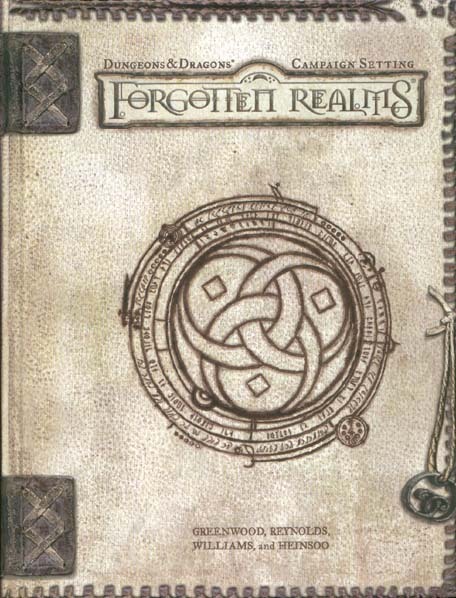 This may be the Gold Standard for any D&D sourcebook. Ever. Which is part of the many reasons, I think that Dungeons and Dragon Fourth Edition was met with such derision by many gamers. It wasn’t backwards compatible and it felt a lot more like a tabletop mini version of an MMO, these are all old arguments. The one argument that it didn’t have any “role play” elements to the rules is thin at best. Any RPG can have as much or as little “RP” in it as the players want. A perfect example of that is the Crit Juice podcast that had bags of character and plot and gallons of booze. I played it a few times and never made that leap with it. It’s great game but it didn’t feel like D&D. 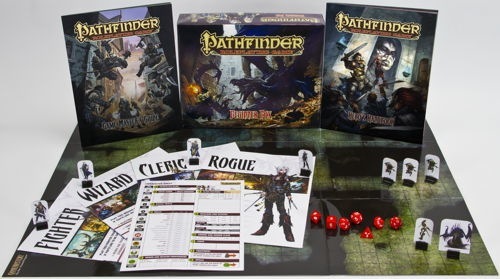 The Paizo produced Pathfinder Beginner Box, the closest that I have experienced to reproducing the “Red Box” feel. I made the jump to Pathfinder, which is also very backwards compatible with everything that has come before. Many of my regular players love it because of the crunch though they don’t bother to learn it. They count on me to do that. This is my D&D ampersand tattoo on my right forearm. He didn’t want to and got weirder so we stuck with Pathfinder. I roll a pretty good “Pathfinder Lite” for newer players or players wanting a Basic D&D feel. I ignore Skills, let people pick out FEATs while not getting to hung up on Pre-requisites and keep the Special Abilities of the classes. For the most part it is addition and that is a mechanic most people understand. At each point, at any given time, whenever I was playing Dungeons and Dragons I was playing Dungeons and Dragons. Even when I play Pathfinder I am at heart playing D&D. As for all of this 5E vs. 3E vs. OD&D and all of them vs. 4E stuff? If you have stuck with this meandering word salad with a heavy helping of geekery then you probably don’t either. As I get older it gets so hard to get a regular game with group going that if I can get a group playing Avalon Hill’s Powers & Perils I would do that in a soul selling minute and the Devil can keep the change. So who cares what edition you are playing? Whatever edition of D&D that you are playing is D&D. If you are having fun then you aren’t doing it wrong.